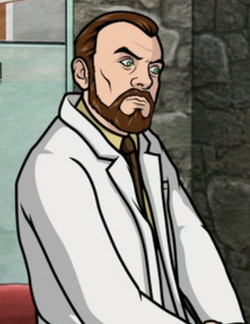 Dr. Krieger fills the mad scientist role for the Archer series. He is the director of applied research, and he has an odd obsession with anything involving cyborgs. This obsession most likely is fueled by his strange sexual fantasies along with his love for emulating Dr. Frankenstein. He has also given evidence in recent episodes that he is of Adolf Hitler's blood line.